Posted on December 24, 2013 by Cynthia G.
Here is a writing challenge that is completely over the top: write with your non­-dominant hand for one page. No more. More than one page is just torture. The reasoning behind this exercise is similar to the logic behind writing by hand and not relying on the computer keyboard for one hundred percent of your writing output. Writing with your dominant hand allows your thoughts to flow unimpeded from your dazzling brain, down your graceful arm and onto the page in a liquid script. You learned to do this type of writing so long ago that the muscular memory is well established and you no longer need to think about how to grip the pencil, focus like a mountain lion, rear back, and assault the page. This type of writing is automatic, never requiring a second thought to secure a type of fluency, and elegance of process. You pick up the pen, you write. When you write with a computer, you access both parts of your brain and manage a fairly linear process of calculating thought, interpreting electronic impulses, dashing off messages with lightning speed. You are capable of producing great amounts of written material quickly; if you are an accomplished enough typist, your fingers can almost keep pace with your thoughts. Likely however, you are able to dash off great tracts of prose produced at a formidable rate, interspersed with small interludes of calm while the thinking apparatus generates more material, whereupon the typing commences at high speed. Alternately, writing by hand slows you down by a least half. The statelier pace of recording thoughts on the page also slows your mind down, and everything relaxes. Your brain has time to linger over thoughts, to meander down lanes of memory and drowse in the dapple shade of summer trees. You can write quickly, but you are still operating at about half-throttle, and there is a more reflective quality to your thoughts and ideas. You can immerse yourself into an idea, you may actually visualize it, take it in with your senses, spend some time with it, date it, get to know it’s quirks, understand the sweetness of it, savor each nuance of meaning before moving on to the next idea. Writing by hand is a tactile and timely experience. You feel the gravity of each word, pushing your pen around the paper. You smell memories; you taste nouns. The idea in your mind merges with your heart and produces lines on a page that more or less mean something. Writing by hand actually means writing by body. It’s not as if your hand is a separate unit from your shoulder, elbow, neck, or heart. You write with it all; because it’s all connected. If writing by hand is a physical experience, writing with your non-­dominant hand is meta-physical. It requires a concurrent focus just to grasp the pen, to align yourself with the paper, figure out at what slant to approach a line of dictation, how firmly or lightly to squeeze the pen. Suddenly, words with billboard-sized letters loom in your mind, waiting, while you work out the downward loop in your cursive f and move on. What an accomplishment! Don’t try to be perfect –you’ll frustrate yourself– unless you were born a leftie and a well-intended but completely disconnected nun forced you to be normal by learning how to write and color and cut paper chains with your right hand. If this is the case, allow me to apologize on behalf of teachers everywhere. You were perfect the way you were, and no one had the slightest right to alter your natural impulses. Write with your weaker hand –and as you do, you will notice that you have to loosen up. At first you’ll be all stiff and stilted, which will be of no discernible help at all. Struggle less, write more. It’s almost as if with less effort your writing becomes more legible, and the mess of spaghetti on the page begins to resemble actual letters connected to convey meaning. Start by practicing writing your name, then the names of the ones you love. Then gradually, work your way up to words and sentences. A paragraph becomes a grand achievement. Once you master the paragraph, work your way up to a page. Don’t worry about speed, it takes as long as it takes, and it isn’t a competition. As you write with your weaker hand, you may begin to notice simplicity of thought emerging in your writing. As your neural pathways struggle to fire and connect, you may find your writing taking an intuitive leap, a creative catapult toward new meaning. While writing with your non-dominant hand is awkward, difficult, unseemly, unruly, undignified, it is also as unimaginably liberating as a good walk in the summer rain, as a slice of pizza for breakfast. We all walk around with a virtual circus playing in our heads and hearts. We carry a lifetime of memories, and a universe of potential. We are at once a young child, and a wise mentor. We are co-workers, and doting grandparents. We are friends and dog-trainers. Vegetarians and comparison shoppers. We are none of us completely and one hundred percent just one thing or even the face we show the world. This is maybe just one of the things that make us such interesting and complex individuals. When we write with our dominant hand, our worlds remain intact, there is no color outside of the lines; all personalities more or less behave as expected. When you write with your non-dominant hand, buried thoughts may rise up to the conscious level, may veer outside the lines in splashes of magenta and vermilion. It becomes messy and a trifle chaotic, but it becomes something beautiful, too. Writing with your non-dominant hand is a bit of a magic trick; now you see it, now you don’t. While you focus on your inelegant claw struggling to grasp a pen, hidden thoughts may trickle in; tiny hairline fractures may appear in the wall you’ve built around the creative juices; the wall itself may start to crumble just a little, and ideas you’d forgotten you had may just trickle in. Et voila! A dove materializes from a handkerchief. I believe in magic. I believe in illusion. I believe that coloring outside the box is not just fun; it’s an innate responsibility of the creative heart. So get out there and write with your less popular, ugly step-sister, non-dominant hand. You won’t like it at first. 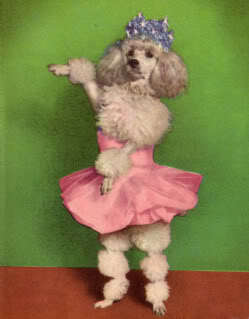 In the beginning it will be as difficult and awkward as a poodle in a tutu. But once you relax and flow with the process, you’ll learn to know yourself in a whole new way, chances are pretty good you’ll like the other, less dominant you. This entry was posted in blog, commentary, journaling, musings, personal essay, women, writing and tagged creative non-fiction, creative writing, imagination, journaling, slow writing, stream of consciousness by Cynthia G.. Bookmark the permalink.